There are many formats in which a tarot can be published, but this is as far as I know this is the only one in colouring book form. Published in 1980 by Stemmer House Publishers, a publisher specialised in children books and Designs from different era's, countries and cultures printed in black and white, as this work is. Miss Caraway has rendered the arcana's in 78 flowing images with a 'cosmic' end of the 70ies feeling, especially pronounced in the majors, the minors are more adaptations of the familiar WCS-images to her personal style giving them all a soft and non threatening feel, an elegant child of it's time! Each major and court-card are printed on a full (approximately) A4 pages sized, the Ace's and twos are put together and the remaining 8 cards are distributed on 2 pages. Some cards have been renamed, so Strength became Vigor, Justice Equilibrium, and Judgement is Transformation. There is a new Thoth-remake out, and knowing how few there are (especially when compared to the amount of Waite-Colman-Smith and TdM-style ones) this is always a good news! Among those children of the Thoth this one is for sure one with the brightest and most vivid colours around so if you like a Thoth using a vibrant palette this might be one to look out for. The artist wanted her deck to be a lovechild between the Thoth yet somehow during the elaboration of it the Thoth took over. In the portray of the archetypes and in structure it's a true Thoth with only here and there some stylistic WCS hints and traces, particularly in the minor arcana. One interesting technique used by the artist is the fact that for each suit and the majors she used the techniques that where closest to the meaning and spirit of that suit, for example for the Cups connected to the element water she used a mixed media technique of watercolor, water-based ink and acrylic, the acrylic comes back in all cards to create an unifying force throughout the deck. The tarot is independently yet professionally printed in a limited edition of only 777 deck and comes in a well-constructed box together with an informative LWB that gives more info about the cards and the structure they are build on - in addition the artist also wrote a companion book for those wanting more. The artist's site is here, to find more about the deck and if you like it even buy it! Le nouveau Tarot Collectors Forum tarot has arrived! Yes it's that moment of the year again, for it's 4th consecutive year members of the Tarot Collectors Forum have put together their efforts, creativity and love of tarot to create a 78 card deck - and once more the harvest from all that labour of love has been a good one. A big project like this one brings its problems with it, many persons working together on the same project but in their own manner, their own speed and personality means there is need for a good organisation with some strong personalities to keep the reigns, but we reached the finish all together and even faster than previous years. Bravo for us all! It is a very exclusive deck, not meant for sale, there is one deck for each participant + one deck for the forums host Adam McLean and one fro the "Museo dei Tarocchi". 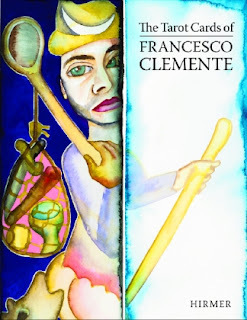 End of August I blogged about the New-York artist Francesco Clementes exhibition in the Uffizi museum in Florence, about the 78 tarot paintings he created. This month a book was published showcasing all 78 paintings + some background about tarot in general, the artist and the creation of the tarot series. An second part of the book is about an other series he maid portraying him as the 12 apostles. The artist behind this deck, Krzysztof Glass (1944-2000) was a busy, engaged and creative person: painter , graphic artist , poet , journalist and political analyst where the fields where he was active in. As artist he began exhibiting his paintings, drawings and lithographs from 1970 onwards in Poland, Hungary, Czechoslovakia, Germany and Austria. 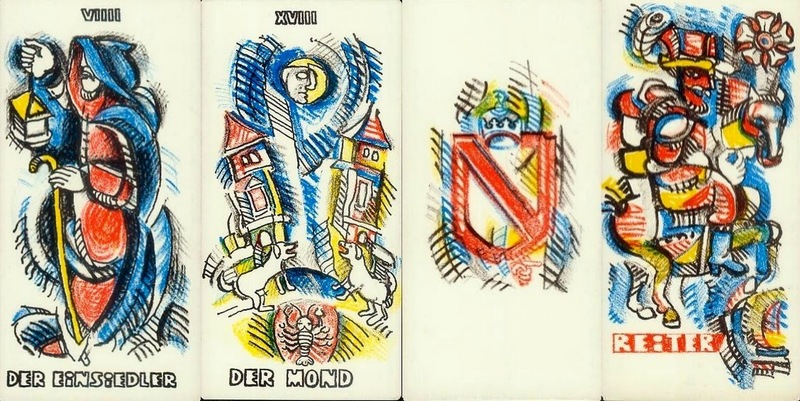 His main interests and concerns in his artistic expression where concerned with both the working class and social themes, but he also created 2 tarots. The second of his 2 tarots came recently into my possession by pure chance and to my great joy of course (all interesting decks always are, and this one is both interesting and extremely difficult to find). This deck was published in 1977 in a limited edition of only 99 decks, and made in a very time and work intensively manner: hand-pulled, with the (very bold) colors added in separate steps a true work of art and great craftsmanship. The only part of the deck that is a bit less are the simplistic pip cards (only the number of suit emblems they represent) but the majors and court cards are stunning and worth every attention they can get, being both very in your face as well as mysterious because of they are shown with dual or split profiles .